LG has introduced LG G7 ThinQ flagship smartphone at an event in New York. It has a 6.1-inch QHD+ 19.5:9 FullVision LCD Super Bright display that can be viewed easily even under direct sunlight with brightness up to 1,000 nits, displaying 100 percent DCI-P3 color gamut powered by Snapdragon 845 Processor. 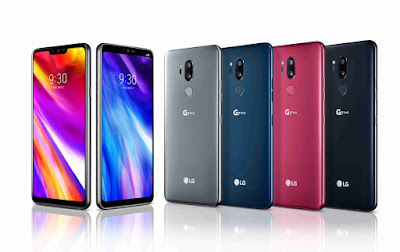 LG G7 ThinQ comes with 4GB LPDDR4x RAM with 64GB (UFS 3.1) storage, LG G7+ ThinQ has a 6GB LPDDR4x RAM with 128GB storage (UFS 3.1) which is further expandable memory up to 2TB with microSD. On Camera, it has a 16-megapixel dual rear cameras, standard and Super Wide Angle configurations. The wide-angle camera now captures landscapes with less edge distortion and selfies are clearer and look more natural compared with previous LG phones, with the new upgraded 8-megapixel camera. It also has AI CAM that now offers 19 shooting modes, up from eight. It also has new Super Bright Camera with images that are up to four times brighter typical of photos shot in dim light through the combination of pixel binning and software processing, the AI algorithm adjusts the camera settings automatically when shooting in low light. The Live Photo mode records one second before and after the shutter is pressed for snippets of unexpected moments or expressions that would normally be missed. It also has Stickers that uses face recognition to generate fun 2D and 3D overlays. LG G7 ThinQ comes in New Platinum Gray, New Aurora Black, New Moroccan Blue and Raspberry Rose colors and will roll out in the coming days in South Korea followed by major markets in North America, Europe, Latin America and Asia. In UK, Clove UK has listed the phone for £649 inc. VAT / £540.83 ex. VAT (US$ 734) and the phone is expected to be available by the end of May.In Europe, Netherlands retailer Belsimpel has listed the phone for €849 (US$ 1,015which is costlier compared to UK. South Korea price will be announced next week when it goes on sale.